August 2006 - When Julie Ullom was 12 years old, her family left the suburban streets of Vancouver, Washington, for 5 acres in the countryside surrounding Ridgefield, Washington. Her Mom had always longed for a horse so it wasn’t long before the family was shopping. The first critter they looked at was a $500 mule. They decided to keep looking. 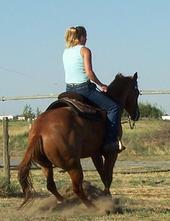 Meanwhile, Julie began taking riding lessons locally. Six months after arriving in Ridgefield, the Ullom’s purchased Nana Skip, a 15.1h buttermilk buckskin Quarter horse filly who had had about as much training as Julie to that point. Julie spent the next year watching as many training videos and reading as many books as she could. She joined the local 4-H horse club and absorbed whatever advice she could at the club’s riding meetings. Boarders at her barn also offered tips. When Julie, her mom, brother, and an aunt flew east to check Meredith Manor out, Julie loved every aspect of the school. Coming from a place where city amenities were readily accessible (Ridgefield is just 15 minutes from Portland), Julie’s was a little concerned that the school’s rural location would be an issue for her. Then she saw how many arenas the school had, how many horses were available to students, and watched the interaction between instructors and students. 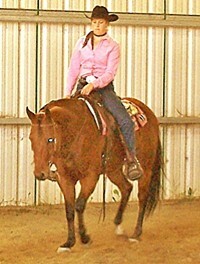 She was particularly impressed at how an instructor handled the situation when a student was bucked off during a lesson. After graduation in August, Julie returned to Lila Hunt’s facility and picked up where she left off while she looked for a permanent job. By December she was a performance horse trainer under an independent contractor arrangement with Columbia River Equestrian Center. 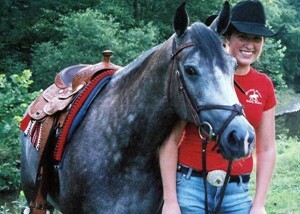 Besides training horses, she also manages the barn and teaches a few weekly riding lessons. To find new training clients, Julie developed a flyer which she puts up at horse venues around the area. The Equestrian Center also puts out her fliers whenever the facility’s mobile tack shop sets up at area shows. “The flyers and word of mouth bring in new business,” she says.